At TOKI, we cross paths with guests from all different backgrounds and places. When we curated a special culinary experience for a chef visiting from abroad, we crossed paths with Chef Shinobu Namae. In getting to know him we were fascinated with his unique philosophies, which he seamlessly incorporates within his own restaurant in Tokyo, L’Effervescence. Namae expertly combines French culinary techniques with Japanese ingredients to create a unique taste palette and a fusion of cultures, and we were inspired to interview him to learn more about his way of thinking. Namae opened L’Effervescence in 2010, and it has since received two Michelin stars, becoming one of Tokyo’s hardest restaurants to book. Upon entering the restaurant, the interior Japanese design elements might not be immediately noticeable. The interior is sleek and modern, comprised of shades of gray and brown. A closer inspection to the details, however, presents a fresh take on the usage of Japanese materials in design. The ceiling is made of yaki-sugi (焼杉) from Ibaraki Prefecture, which is a material that was used traditionally for its fire-resistant qualities and ability to withstand rain and wind. On the far side of the restaurant, light reflects off the metallic, wavy wall. For this wall, a special type of Japanese paper called mino-washi (美濃和紙) was applied, followed by a layer of charcoal, and lastly a layer of kira (雲母, the mineral mica). This was all applied in a lengthy, traditional method by a ginpaku (銀箔) craftsman (ginpaku is the silver foil used to cover traditional folding screens, etc.). On the adjacent wall, you will find tsuchi-kabe (土壁), which is a traditional style of mud-wall, and can be found in places like tea ceremony rooms, known as cha-shitsu (茶室). These various Japanese traditional architectural components are blended together in a way that is fresh and new. Namae explained that before he spoke with the ginpaku craftsman, “I don’t think they had ever done this for a private restaurant before, so I wasn’t sure if they would be open to doing such a job.” Namae’s incorporation of Japanese traditional elements in a modern space is refreshing, and he explained that the natural materials used will change in appearance over time. Although L’Effervescence is a restaurant that exhibits traditional Japanese elements, Namae wasn’t always fond of this. “At first, I didn’t like Japanese things, I didn’t like Japan. Thus, I studied Western-style cooking,” he said. Namae came to rediscover and appreciate the value of Japanese culture. Namae explained that in his desire to learn more about Japanese culture, he decided to study Japanese tea ceremony. In doing so, he learned something very important about Japanese culture—that there is a meaning and a reason behind everything and every action. “They aren’t meaningless rules. They are backed by reasons that were developed through logic." Namae explained that these might account for one of the reasons Japan's society is so orderly and peaceful." By understanding that there is a deeper meaning to everything, you learn to appreciate things.” Namae's fondness for Japanese culture grew with time, and the Japan that he steered away from for so long is something he has come to love. Namae’s own studies in the tea ceremony led him to require his own staff to study Japanese tea ceremony regularly. Namae explained that the benefits of doing this go far beyond the act of serving tea. These concepts transcend the tea ceremony, and for the staff at L'Effervescence, they became more aware of things such as the simple gesture of laying a plate down carefully with both hands and the art of conversation. 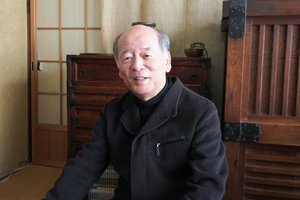 This connection is also fostered by communication between the guests and the waiters, which was another improvement that Namae attributed to tea ceremony studies. “The staff began to talk more and communication improved.” Namae noted that communication improved not only with the restaurant guests, but also among themselves. He mentioned that his staff has even organized group trips to travel and meet the glass artisans who made the restaurant’s glassware as well as the farmers who grow the ingredients that are used. It is through the tea ceremony that they gained a sense of appreciation for the things around them. For us, we felt the fruits of their studies in the atmosphere; the friendly and sincere demeanor of the staff created a harmonious space that was a comfortable escape from the hustle and bustle of the city. Speaking of good food, we headed to the kitchen and were allowed to witness the behind-the-scenes culinary magic. Namae explained that just about all of the ingredients are Japanese-grown, and that all of the seasonings used—miso, vinegar, fermented foods—are made in the kitchen from scratch. It should be noted that restaurants seldom take the time to make these kinds of bases. First we were shown the making of nukazuke (vegetables fermented in rice bran), which is allowed to ferment in a large ceramic jar. Namae explained that fermentation plays an important role in Japanese culinary culture, and he utilizes this in many dishes. “Hakkou (fermentation) is used mainly for two purposes: to preserve food and to make it more delicious. We can use microorganisms to ferment food, and by adjusting the temperature—either adding heat or removing it—we can make different flavors or textures.” Namae uses this traditional knowledge of Japanese cooking in his cuisine to further enhance his French-style cooking in a way that is unique and innovative. Namae's words were thought provoking, and for us at TOKI, they resonated with the philosophies we strive to promote. Upon leaving, Namae drew our attention to a tree stump located directly outside of the entrance. He told us that they found this large keyaki (Japanese elm) stump at a lumberyard, where it was going to be thrown away. Namae decided to bring the stump back and place it at the entrance of the restaurant. It wasn't long before a stalk appeared from the crevices of the big stump, and although Namae contemplated cutting it down, he let it grow. It turned out to be none other than a baby keyaki, sprouting from its mother's trunk. We realized that this tiny tree sapling, something that we typically wouldn't notice, was exactly one of the details that Namae was talking about. Namae's words are exemplified by the keyaki and L'Effervescence alike; even the smallest details, when appreciated and not overlooked, can result in a world of difference.